Rossini is remembered primarily for his immense contribution to the Italian operatic repertoire, but he also produced two important pieces of sacred music that are notable for their overtly operatic style. These two important religious works are the STABAT MATER (1842) and the PETITE MESSE SOLENNELLE (1863). Rossini didn't compose nothing of significance during the last 40 years of his life; within this span of life he retired completely, and composed "Stabat Mater" and "Petite Messe Solennelle". 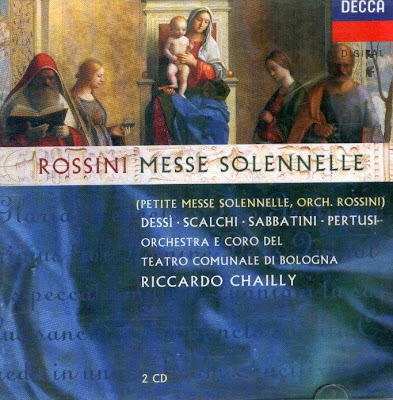 The Petite Messe Solennelle is the most substantial of the works written during Rossini's Indian summer of composition. It was composed in 1863 for private performance and is scored for four soloists and chorus, with harmonium and piano accompaniment. Rossini discreetly orchestrated the Petite Messe Solennelle during 1866-67, partly for fear that it would be done anyway after his death. Without losing its candor and subtlety, the resulting version had its first public performance on 28 February 1869 , three months after the composer's death, and as close as could be to what would have been Rossini's seventy-seventh birthday— at the Théatre Iatlien, Paris. That year both versions were published. The Compact Disc was released by DECCA, 1995, (DDD). Decca 444134-2 (DX2).